The title of my new work Crie (pronounced Cree) is from the French word meaning to cry out. It was specially conceived and written for violinist Véronique Serret. 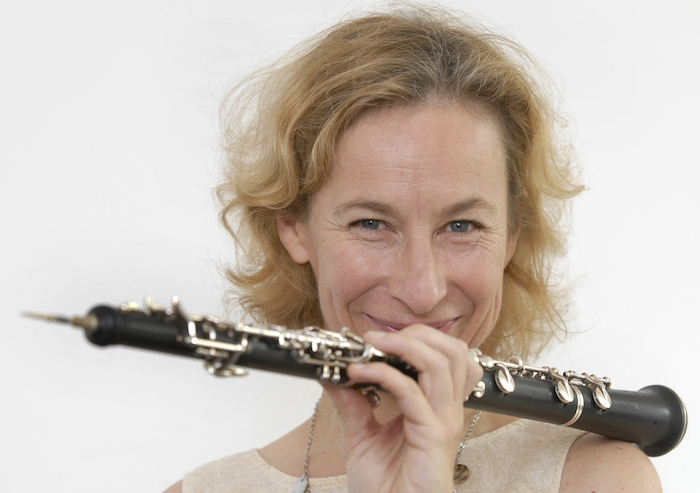 Véronique has a very rich speaking voice which had always impressed me, and although playing and singing together is never an easy task, I knew the piece I was writing would be in great ‘voice’ with Véronique. As I proceeded to write it turns out that my subconscious instinct lay not only with the pure task of a piece for violin and voice, but also arose out of the urgency of our present historic moment. Increasingly we are hearing of women being courageous enough to speak out about untruths or abuses. We have as an extreme example the Maltese journalist Daphne Caruana Galizia, who was murdered for publishing her research on governmental corruption in Malta. The question remained, with what words should this piece begin? I experimented a lot myself with violin – finding pitches, chords, vocalisations, searching to complement the sound world of string with that belonging to the human voice. Interestingly, my recent premiere with the Adelaide Symphony Orchestra was a concerto for voice and guitar entitled DACCORD, alluding to strings and vocal cords. In both pieces, DACCORD and Crie, I chose the phonetic alphabet over words, wishing to explore the assemblage of sounds. In Crie I wanted to delve more intimately into the initial utterance with the voice, so that meaning was directly derived from the nuances of the combined expression of violin and voice. We seek a new, fragile, courageous journey for the performer whilst exploring her own path to utterance. To speak words we must breathe, to express words we must find our voice. This piece is about finding one’s voice and having the courage to utter its sound. The word ‘utter’ itself comes from the Dutch üteren, which means to speak but also to ‘make known’. It is a reinforcement of the impetus behind this piece that the word utterance is not just an indication that something is vocalised, but has to do with making something known that would otherwise be hidden. This work is dedicated to brave women such as Daphne Caruana Galizia, who have been silenced for speaking out. Let us find our voice. Between classic Xenakis and contemporary Australian fare, Ensemble Offspring's Lone Hemisphere was one for the fans. In his new work for the Australian String Quartet, the composer holds a mirror up to the form made famous by Joseph Haydn. Nicholas Carter’s final year as Principal Conductor features a world premiere for Pinchas Zukerman’s 70th birthday, and Jayson Gillham playing five Beethoven piano concertos. An exciting, vibrant program that felt a little too big for the Utzon Room.